With produce that is harvested for processing, there is often dirt and other debris that goes along for the ride. Our customer for this conveyor hand picks their produce and places them into trays. They needed a way to separate the debris from the product as early in the process as possible. Recognizing that mud, dirt, straw, and stones could be picked with the produce, they needed a conveyor that would be easy to clean and maintain. In addition, some of the produce like strawberries or mushrooms were fragile so the conveyor needed to gently handle the product being dumped onto it. The unique design that Dorner Engineering used for this project is ‘o-ring’ style belting and AquaPruf conveyors. The ‘o-ring’ belting allows for smaller debris to fall through the belt to the catch pan while keeping the larger product moving down the conveyor.By spacing out supports for the belting, three zones were created that allow the belting to flex downward. This flex provides a cushion when the trays are emptied onto the conveyor. Plus, by utilizing AquaPruf conveyors open frame design and advanced cleaning features, this conveyor cleans up with ease. The rear portion of the conveyor is removable without tools. It also allows for the tip-up tail to release the belt tension – providing instant access to the frame for sanitation. 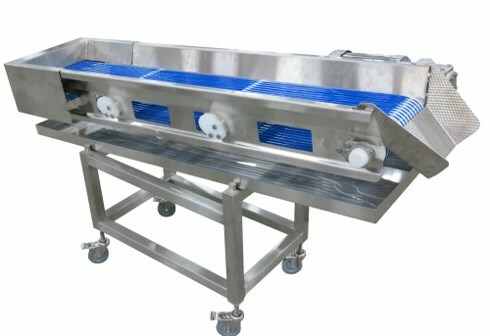 In addition, the drip pan on the bottom simply slides out for removal and cleaning.Watch the video below to see the just how easy the AquaPruf conveyor is to clean.